Easy! Get a bear or, in our case, several bears. In 48 years of camping at Grundy, I've seen one bear but dozens of raccoons. So far this year, I've seen 4 bears, heard 3 others but I've only seen one raccoon. Coincidence? I don't think so. 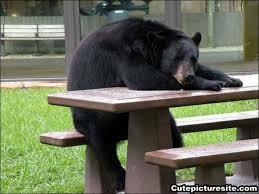 The bears are getting pretty aggressive because there are very few berries this year. They've been wandering around the campgrounds all summer. So far, the rangers have trapped 12 of them but they just keep on coming. They appeared on the lot right next to me (the one I used to be on). The one big male went under the campers' awning and munched on some citronella candles while the people were sitting around their campfire only about 15 feet away. Needless to say, the campers were guilty of making some "excessive noise" that night. The next night, a younger bear came trotting through the same campsite and the guy had to throw a chair at it. A few days before, a bear tore the back window off a truck cab to get at some dog food. 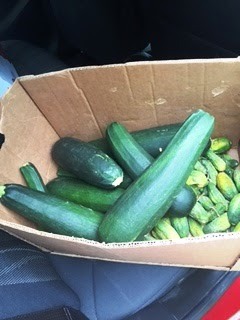 I'm beginning to wonder if I should get the box full of zucchini out of my car. Speaking of zucchini.... you have to watch what you say around here. We had friends over the other night and they mentioned that their garden was producing very well. They asked if we'd like some zucchini and we said sure. The next day, we found a box full of zucchini, cucumbers and peppers on our picnic table. Looks like I'll be turning vegetarian now. Anyone got a good recipe for zucchini bread?